Half-hour superhero comedy. Six episodes watched for review. 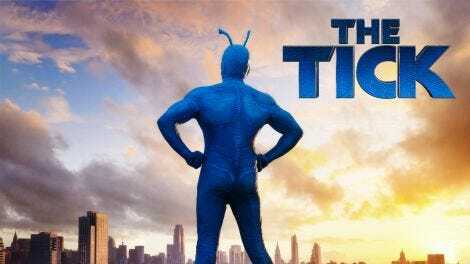 Ben Edlund’s The Tick has always been a little out of step with modern times, regardless of when that “modern” happened to be. As a cartoon superhero in the ’90s, he was weirder than anything else on Saturday mornings by a country mile; as the star of a Fox sitcom in the 2000s, he and his superhero pals were openly goofy in ways that weren’t necessarily in vogue. (Not that that resolute march to the Big Blue Bug’s offbeat drum was a bad thing; there’s a reason both shows are still well-regarded cult hits.) But it seems like TV might have finally caught up with The Tick at last, because Amazon’s new take on the character—forgoing bad-guy-of-the-week battles in favor of serialized storytelling, and happily pitting its heroes against self-doubt and family expectations as often as rampaging supervillains—is the closest Edlund’s superhero parody has ever come to fitting in with the tastes of the present day. That new approach is best embodied in the changes the new series makes to the franchise’s other mainstay, Arthur, who’s no longer just a mild-mannered accountant getting his kicks by hopping into a moth suit and pulling sidekick duty for his giant friend. When we first meet him, Arthur—who, as played by Griffin Newman, is the obvious protagonist here, complete with tongue-in-cheek references charting his path along the hero’s journey—is clearly a little bit off, even by amateur superhero standards. He furtively spies on criminals; lies to his sister, Dot (Valorie Curry), about taking his medications; and occasionally outs himself as a full-blown conspiracy theorist, fixated on the idea that a supposedly dead supervillain is pulling the strings on local crime. 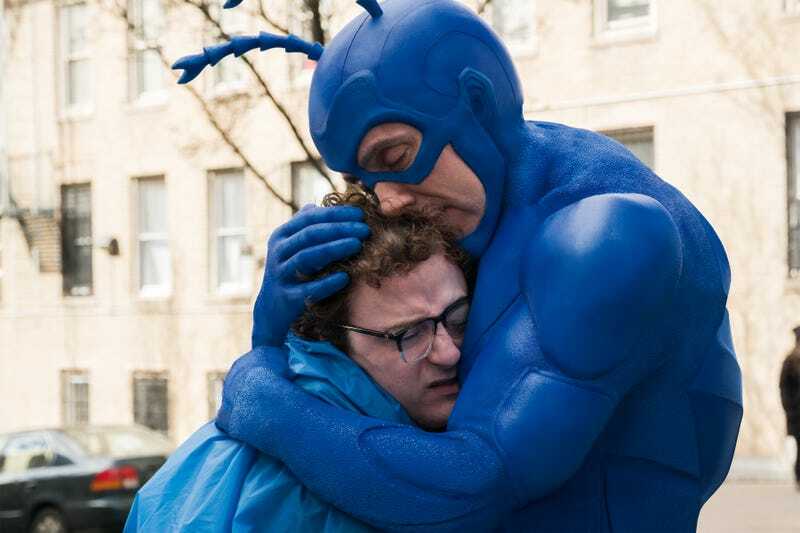 None of these anti-social tendencies are helped when a stakeout-gone-wrong leads to him meeting The Tick, a big, blue, invulnerable superhero who insists that he and the reluctant-but-obsessive Arthur are bound together by the ties of destiny. The show’s early episodes are largely centered on the warring arguments playing out in Arthur’s head, between Dot’s worried “normal is as normal does,” and the invulnerable weirdo literally shouting into his ear that he’s just as special as he’s always hoped he might be. Played, sans the usual drips of irony, by British actor Peter Serafinowicz, this Tick is a more human bug than any of the versions that have come before, a little more vulnerable, if no less loud. Where Townsend Coleman played the character with maximum bombast in the ’90s cartoon, and Patrick Warburton portrayed him as a giant, superpowered kid, Serafinowicz’s Tick is capable of letting a little bit of worry leak out around his eyes, especially in his quieter moments. When he’s in the middle of an aggressively one-sided fight, slapping bad guys around and cheerfully laughing as their bullets ricochet off, it’s all confidence and quips. But once the battle is over, Serafinowicz drops some of the bluster and adds hints that he knows that there’s something badly wrong with the character’s brain. His puppy-dog attachment to Arthur—the one guy he’s apparently willing to let do his thinking for him—lends the series a healthy dose of pathos, even as Serafinowicz clearly delights in dropping boisterous non sequiturs about picking up the phone when destiny calls collect. That tonal tightrope act is all over The Tick, a show that’s happy to juxtapose legitimately traumatic backstory moments with a bunch of superheroes bemoaning an attack by “weaponized syphilis.” The result feels at times like a less cynical version of The Venture Bros. (which Edlund has written for), forcing a bunch of broken people and their very real feelings into the absurd superhero situations their jobs and weirdo lifestyles demand. That humanity extends to the bad guys, too: Some of the most effective moments in these early episodes come from recurring villain Ms. Lint (Yara Martinez), whose lightning-based powers and persistent static cling problem exist alongside legitimate heartbreak at the death of her old mentor The Terror. Said ancient supervillain is played in flashbacks by Jackie Earle Haley, whose efforts to inject the character with a mixture of menace and warmth are only slightly undercut by a ridiculous “old man” voice. This Tick is a show where silly, funny things happen all the time, whether that comes in the form of a gravel-voiced ’90s antihero named Overkill arguing with his talking boat (Alan Tudyk, who’s basically reprising his role from Rogue One) or an Egyptian-themed crime boss who gets pissy when his assistants don’t adopt matching Eye Of Ra tattoos. But it’s also a show about a guy struggling to come to terms with what being “normal” actually is, and whether he even wants it. That increased interest in the inner lives of its characters is the real meat of this new series, even as it provides all the nonsensical one-liners, giant naked men, and superhero parodies that fans of these characters have come to expect.